These are our thoughts, what are yours? To ensure certainty with your trees find out first if they are protected with the local authority. Look at when they shade your living space including your neighbours trees. To avoid complaints check when they are close to structures such as boundaries walls, patios, pipes, roads and utility lines. To avoid injury or ill health understand what they bring….pollen., seeds, saplings, poisonous berries and or foliage. .
And know where they are going…to be certain of their quality, future size and safety. A site walk over survey may lead to a safety survey or a scope of works survey. This is then followed by tree works. Please get in touch as we can definitely help. How and when do you want to use your space? The landscape may be bare such as a new home or overmature following a purchase. You may consider development, or the kids have grown up. The layout, patio, raised beds, working garden, summer house, garden office, greenhouse, hot tub, outdoor gym, children’s play area, water features and back garden football pitch. Low maintenance garden, wildlife friendly, fruit and vegetables. Climbers, conifers, trees, shrubs. Scented and shade tolerant. Thorny barrier planting. On site consultancy exploring the options and the do-ability of this. Please get in touch as we can help. When did you last invite an expert into your landscape? Plan regular visits for pruning works. A healthy tree should be reviewed every 5 years. Growth of your investment requires a timely response to avoid spending more money than necessary. Review growth rates, watch out for pest and disease. Know when to water, feed and prune. Decide on the next stage of your project. Our select client base come back to us year after year. It may be call,or email to get a timely response. Climate and disease variations ensure we provide you with the right tool to make good decisions. Join us at Ace of Spades Gardens to ensure your place looks great. This is the second in a series of three observations of complete failures within the planning framework. Currently within Norfolk we are seeing government and local authority money being used to build new link roads. A relief to the weary motorist. New roads are now being planted and landscaped but sadly not always complying with BS8545 tree planting standards. •	Salt tolerance and wind tolerance, it’s a roadway. •	A three year after care plan. This is the Northern Distributor Road north of Norwich May 2017. Planted by Norse. •	The tree staking to the pines shows no compliance with BS8545.If the trees survive they will be structurally compromised by the inappropriate staking. 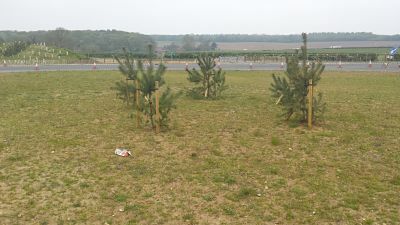 •	Black pines grow to 28-30 meters so the spacing and species choice is inappropriate for a motorway embankment. •	There are no weed mats, or evidence of ground planting of shrubs to suppress the weeds. Mass planted trees on a roadway are planted to a budget with a low financial costing. Replacement trees are planned for as failures are expected. The species mix of trees subject to site conditions is to avoid mono-cultures this prevents the mass loss of tree species to current and future pest and disease. In this case, it seems the tree planting is exposed to this risk. In this case, its highly likely most if not these trees and shrubs will fail because it was not implemented correctly from the planting design layout specification through to the contractors planting the roadside embankments. Contact Ace of Spades Gardens Ltd for more information about tree management and planting plan specifications. It seems that our landscapes are subjected to the constant onslaught of pests and diseases. We walk past them every day, but sadly there is weekly news about ash die back, sudden oak death, oak processionary moth or threats to our plane trees. These trees may take hundreds of years to establish themselves. They are majestic within the landscape. They feature around many of our life events providing a beautiful quite appropriate back drop. What do you do to look after your trees? Probably nothing…sweep up the leaves…prune the odd branch or complain they are shading. How to find out what the benefits of trees are? What are the new exciting ways of correcting the health of trees? Tree health can change such as after flood events, damage to the trees following development or due to the infection of pest and disease. Sometimes the tree pest such as oak processionary moth can be real threat to human health. In the treatment of tree diseases, the impacts to non-target fauna such as moths and beetles is a consideration and is carefully planned. We know that trees have their own ecosystems. Biochar with nutrient additives. Biochar is simply the residue of burned wood. Nutrients are as simple as compost. These mixed to together with the correct amount of nutrients is a therapeutic long term way of improving tree health. Hardwood biochar has been found to be the best. This is useful to ensure trees can tolerate drought, improve the crop yield of fruit trees, vitality improvement, improve tree transplant survival and to reduce the severity of soil borne diseases such as Phytophthora or honey fungus. Air spading or breaking up the surface soil layer around tree roots with the addition of biochar or biological fungi can improve tree health and break up areas and of and weaken honey fungus with the soil. Plant defence activators. The addition of phosphites or chitin (crab shells) around the tree roots may stimulate a trees defenses to the future disease such as honey fungus. The tree switches on its guard to reduce or prevent the future infection. Mulch. Chipped green mulch around tree roots but not in contact with the tree stem can suppress tree diseases and or switch on the tree defence activators. Willow tree mulch contains salicylic acid which suppresses diseases and switches the tree on. Eucalyptus tree mulch suppresses the effects of ash die back. Cherry and hawthorn mulch stimulates growth more than any other mulch. It seems everyone is talking about “climate” …so how do the trees really effect you? We walk past them every day. We see them from our windows, when we are outside relaxing they are a joy to be around, they change during the seasons, they are home to wildlife and you probably have a favorite one from your childhood. The cooling effects of trees has long been established. The shade from trees plays a role the in the mechanism by which trees leaf cool their surroundings by evapotranspiration. This is linked to the successful growth of trees. Therefore, healthy trees planted correctly and watered well are essential, especially within the urban heat island. The summertime energy demand from buildings and vehicle cooling is reduced. This reduces energy pollution emissions. And careful planting and tree shapes can avoid winter month’s south facing walls not being shaded. Trees planted in groups may alter the microclimate of a landscape such as within urban shopping centers, car parks or parklands. This makes these venues more pleasant to use and reduces the effect of maximum surface temperatures. Trees near shops also can incase dwell time around the front of shops. Evergreen trees can reduce heat loss during the winter months by reducing wind speed and thus air infiltration into a building. Optimally planted rows of trees in relation to prevailing winds and possible solar gains into a sheltered building during winter time can help save up to 18% in energy costs. Trees can be planted to reduce wind speed and turbulence for pedestrians. Trees provide food, shelter, nesting and roosting sites for a wildlife build up. As cities are warmer during the winter months’ certain species migrate to city trees. The spacing of trees within a landscape also has a bearing on the movement of species between them such as bats. Large gaps are difficult to cross. Tree cover reduces rainfall run off. The leaves soak up the rainfall slowing down the draining process. But trees may also play a process in drying out the infiltrated soil layers. Evergreen trees intercept more rainfall but transpire less than deciduous. Meaning deciduous trees species dependent may dry the ground out somewhat quicker than evergreens. Trees and plants are physical obstacles and have an effect on wind speed and turbulence. This is linked to how effective trees are in the removal of air pollutants. Wide tree planting such as forests drive wind upwards and act as a solid barrier. Wind speeds beyond the forest return to normal after a short distance being 10 x the height of the trees. Planting linear trees with shrubs below may reduce a contaminated air flow. If you live near a busy road or motorway you maybe twice as likely to dies from heart disease or a vascular condition. Tree filter out particulate pollution within leaves, they absorb gaseous air pollution through their leaves and through their roots pollution is taken up and sequestered into the plant materials. Conifer are particularly good at collecting particulates with some being retained, others being released by the wind or washed down the tree with rain. Overtime organic matter in the soil beneath trees can bind up pollutants. A quality outdoor environment including street or front garden trees can increase the levels of physical activity such as walking or cycling. This in turn reduces pollution and climate effects. Planted trees act as buffer between the highway and the footway and can give guidance to routes as well as slowing traffic down. So if you are considering the management of your trees or a new planting scheme get in touch for advice and learn how to embrace the real climate benefit of trees. As a home owner with garden it’s perfectly acceptable to prune shrubs, sweep up leaves, pull out weeds and cut the grass every couple of weeks and that might just contain the growth. And as spring is now here this work is starting and will quickly accelerate. In the UK we all love our gardens to look good and its expected that they are maintained and yes we all watch gardener’s world to find out what we should do when and how. It may also be that we work from home like 4.6 million of and yes this could be great meeting space with clients. However, a lot of us do not have the time, the tools if they still work or the knowledge to know what to do how and when, such as late winter early pruning of roses or pruning an overgrown hedge. The problem is knowing where to start so we have decided give you 5 reasons on how to start. You may not know that tree branch pruning or tree removal works can significantly open up the garden. Hedges and shrubs cut or pruned to shape will create space for you to enjoy and not feel closed in. So it’s best to decide what you want to do, for example it maybe where the sun is when during the day when you are likely to use the garden. This may take the form of habitat piles of deadwood for beetles, hedgehogs, lizards and even snakes. Allowing the flowering and seeds to form upon trees and shrubs for insect or bird food sources. To even watching butterflies or bees collecting nectar from a weeded overgrown area containing nettles, brambles and honeysuckles…basically the imitation of natural habitat. During the forthcoming year we will all make a trip to a garden center or nursery to look at plants, climbers, shrubs or trees that will provide structures such as archways, grow to cover fences or walls and may provide a feature such as a flowering cherry tree. The excitement of choice, the problem of how to get it back to where you live and the planting and aftercare. A before you know it the garden knits together after the change. 4. Health, happiness and relaxation. After a busy day time in the garden reading, drinking wine or even family events are great for our health and wellbeing. It’s about quiet time away from screens and conversations and sharing good feelings. In fact, this time can be between March to October so this why we need to do more gardening in the extra room to our home. Yes, the growing of fruit or vegetables can be rewarding, time consuming and involved. Allotments are useful but time consuming. Some small changes to the landscape such as raised beds, pergolas or wire frames can provide bespoke structures within the landscape that integrate within the existing garden. Want to spend quality time in your garden in 2016? then Join us at Ace of spades gardens to get the right advice.